The Nigerian customs has identified the importer of a deadly cargo that smuggle into the country 1,570 guns seized at the Lagos Port. According to the agency, Great James Oil and Gas Ltd, a Vessel, MV Arkas Africa, owned by Hull Blyth, was used in the illegal shipment of the guns. The importer, Comptroller-General (CG) Col. Hameed Ali (retd) said used the elbow plumbing plastic he declared in his bill of lading as a decoy to deceive the service before the container No. CMAU189817/8 was subjected to 100 percent examination by his officers and discovered the 470 guns that were concealed inside the container. The guns, concealed in a 20-foot container, were seized by the Area Comptroller Tin-Can Island Customs Command, Mr. Bashar Yusuf. This is coming just as the federal government is set to meet Turkish diplomats today over the spate of illegal importation of rifles from Turkey to Nigeria. ColAli (retd) said this when he briefed reporters over the seizure of another 470 rifles at Tin-Can Island port in Lagos. It was learned that the new container, in which 470 rifles was found, belongs to the same importer of the 1,100 rifles seized at the port a few days ago. 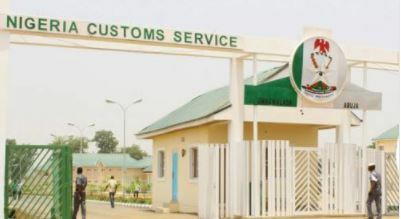 Col. Ali said the Customs Service was sad to announce that in spite of their previous efforts, officers of the service at the Tin-Can Island Port intercepted the 470 rifles shipped into the country from Turkey.